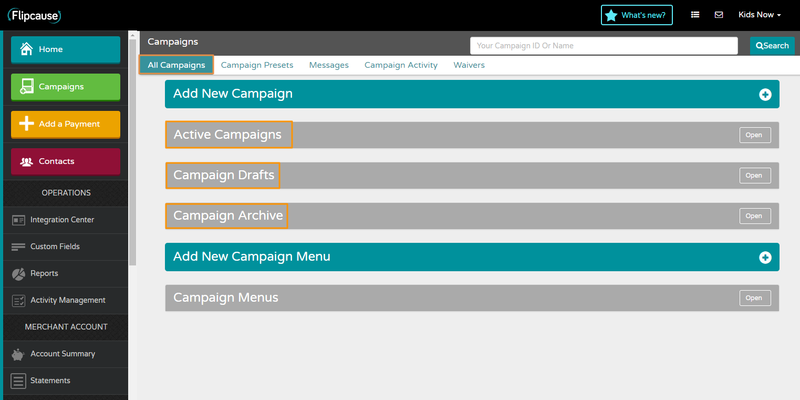 In the Campaigns main area, under the first tab All Campaigns you'll notice the sections Active Campaigns, Campaign Drafts, and Campaign Archive. This is to give you more flexibility in your workflow, and separate the campaigns that are ready to be live, campaigns you are still in the middle of working on, and campaigns you no longer need. When you click "Publish" on a campaign, it will put it in your Active Campaigns section. This will NOT automatically add this campaign to your website or anywhere else (except to the list of all active campaigns, which can sometimes be found at the bottom of another campaign). Clicking "Unpublish" on a campaign will move this campaign from your Active Campaigns to your Campaign Drafts section. Clicking "Archive" will move a campaign into your Campaign Archive, and from here you can delete a campaign if you'd like to. We recommend avoiding deleting campaigns and keeping everything you no longer need under "archives" so you can refer to it later. You can always re-purpose a campaign draft you decided not to use. On each campaign card, you can select either Unpublish/Publish to move the campaign in and out of Active/Drafts. You can Archive the campaign from here as well.